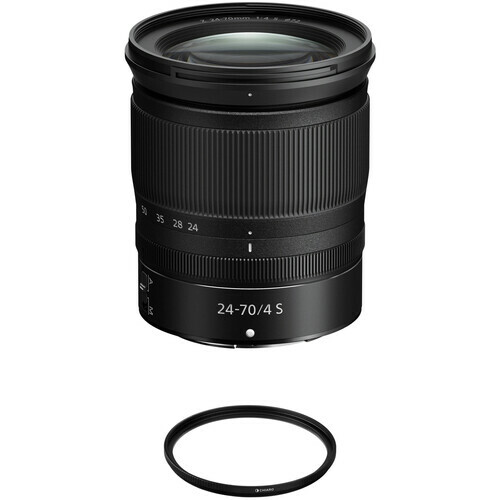 Complementing the lens itself, the Nikon NIKKOR Z 24-70mm f/4 S Lens with Circular Polarizer Filter Kit from B&H bundles the versatile standard zoom with a 72mm circular polarizer filter. Covering a useful range of focal lengths, the NIKKOR Z 24-70mm f/4 S is a versatile zoom, spanning wide-angle to portrait-length perspectives. Its constant f/4 maximum aperture maintains a consistent exposure throughout the zoom range and also helps to realize a more compact and lightweight alternative to an f/2.8 zoom. In regard to the optical design, a unique aspherical extra-low dispersion element, in addition to three aspherical elements, is used to help reduce chromatic aberrations and distortions throughout the zoom range in order to achieve high image sharpness and clarity. Both Nano Crystal and Super Integrated Coatings have also been applied to control flare and ghosting for greater contrast and color rendering in bright and backlit conditions. Complementing the optics, a stepping motor provides quick, quiet, and precise autofocus performance along with full-time manual focus override to suit both stills and video applications. A programmable control ring can be set for intuitive adjustment over a variety of camera and exposure settings. Additionally, the lens has a button-less retractable barrel to realize a more compact form factor when not in use. A unique aspherical extra-low dispersion element is incorporated into the optical design, along with three additional aspherical elements, to greatly reduce chromatic and spherical aberrations, distortion, coma (comatic aberration), and flare for consistent edge-to-edge sharpness and illumination. Exposed elements feature a fluorine coating that affords protection to the optical system against dust, grease, and water droplets. Button-less retractable design maintains a compact form factor when the lens is not in use. The Hoya 72mm NXT Circular Polarizer Filter helps to reduce reflections and glare by filtering out light that has become polarized due to reflection from a non-metallic surface. The light from the sun naturally becomes partially polarized due to reflecting off electrons in air molecules, causing the light to scatter into what appears as haze. A polarizing filter arranges, and filters, this directionally polarized light perpendicularly to the reflected light, allowing for the absorption of much of this light. This results in a noticeable reduction of glare and reflections from non-metallic surfaces and an increase in the saturation of skies and foliage. This filter is non-coated. Hoya NXT filters have over 97% average light transmission, and are constructed from heat-resistant, high-transparency optical glass. Over 97% average light transmission. Constructed from heat-resistant, high-transparency optical glass. Box Dimensions (LxWxH) 8.0 x 5.6 x 5.6"
Box Dimensions (LxWxH) 4.3 x 3.5 x 0.6"